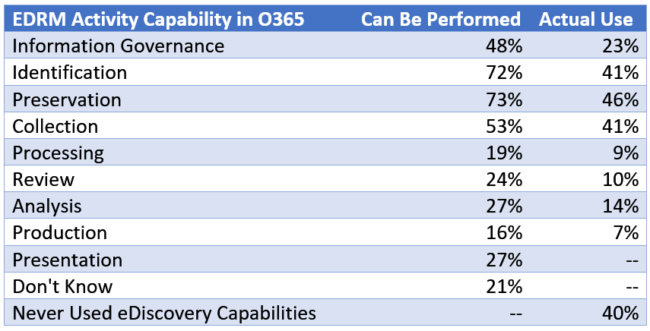 In August 2018, Don Swanson, president of Five Star Legal, and Tom O’Connor, director of the Gulf Coast Legal Technology Center, launched the Microsoft Office 365 eDiscovery Challenge, a survey to determine whether Office 365’s e-discovery capabilities are up to the task of handling an eDiscovery matter on a limited budget. The survey was conducted over seven weeks from August 15 to October 15, 2018, using both an online SurveyMonkey tool and telephone interviews. We received a total of 75 survey responses from corporations, government agencies and law firms, with the breakdown of respondents being predominantly from corporate legal. The survey is a follow-up to earlier works, first released ten years ago in 2009 by Craig D. Ball (EDna: Still Cheap and Challenged) and Tom O’Connor (To Edna and Beyond: The Ernie Challenge ), that presented hypothetical small and “tweener” sized cases and sought input about eDiscovery on a limited budget. Respondents to those challenges offered technology and methodology solutions designed to handle these cases on a restricted budget. Raw data from the survey was first published on the Law Sites blog in November 2018. Office 365 implementations are growing rapidly and the Microsoft eDiscovery tools are both helpful and needed as law firms, corporations and government agencies are changing the way they manage eDiscovery activities. Here is our summary of the survey findings. Corporate and government legal departments are moving from on-premises, company-managed email servers to the cloud-based, Microsoft subscription offering. An overwhelming 93% of survey respondents said their organizations were either already on or moving to Office 365, while just 7% reported no plans to move to the Microsoft cloud-based subscription service. As Doug Austin noted in his popular blog, first reactions to Microsoft offering eDiscovery features were positive. Two-thirds of respondents stated Office 365’s eDiscovery features were somewhat or very positive and promising. The eDiscovery features are widely known. Only 13% were unaware that Office 365 included eDiscovery functionality. Microsoft Office 365 is offered at several subscription levels, and the E3/G3 is most commonly reported. The E3 subscription is the commercial enterprise service while the G3 is the government offering. The E3\G3 includes many eDiscovery features, but does not include the advanced capabilities contained within E5/G5. The survey respondents focused on the identification, preservation and collection capabilities within Office 365. The survey results suggest that Microsoft eDiscovery is not currently an end-to-end solution. Some key statistics include: a) 40% of respondents had never used Office 365 eDiscovery, b) only a small number (<25%) felt that processing or review could performed within Office 365, and c) less than 1 in 7 reported performing eDiscovery analysis in Office 365. Perhaps this isn’t surprising since the ILTA 2016 Litigation and Practice Support Technology Survey reported zero instances of Office 365 being used for processing, early case assessment, or discovery review. 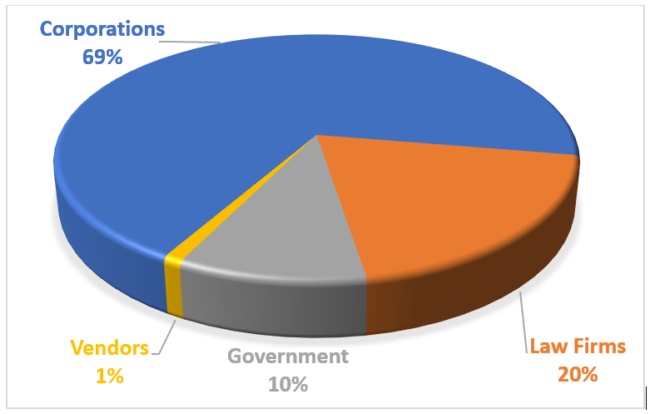 On a more positive note for the Microsoft eDiscovery team in Redmond, the Microsoft Office 365 eDiscovery survey respondents reported that their organizations had performed identification (41%), preservation (46%) and collection (41%) within Office 365. These “left-side” EDRM activities are the clear entry points for Microsoft eDiscovery. As the Microsoft eDiscovery offering matures, expect to see more corporate clients performing early case assessment, processing and review activities “in-place” within the Microsoft cloud environment. A staggering 82% of survey respondents acknowledged they “probably” or “definitely” need Office 365 Microsoft eDiscovery tools. Just 2% answered they did not need these features. These findings all seem in line with other survey findings such as the ILTA survey mentioned. The 2018 Exterro In-House Legal Benchmarking Report found that companies were preserving more data, with email (90%) and Microsoft Office files (89%) leading the way. Of those, 26% were self-preserving all matters thru custodians, with 26% saying they did so in at least 75% of their matters and another 21% did it in 50% or more of their matters. Of the other 50%, the majority (77%) were giving it to IT to handle. Which method did they most prefer? Twenty-eight percent said self-preservation and 26% said preservation by locking documents in place through an archive system or Office 365. In another interesting survey result, the 2018 Norton Rose Fulbright Litigation Trends Annual Survey found that while 76% of corporate counsel survey respondents were adopting data repositories and 72% were implementing document preservation tools, only 54% were using TAR. The 2018 ABA Legal Technology Survey Report found that only 12% were using predictive coding to process or review e-discovery materials. Interestingly, 80% used keyword searching, but that’s another story. The ABA survey found that 73% of respondents used TAR for culling data down at the front end, 28% of respondents wanted a “simple” review tool and 25% wanted an all-in-one program. These needs could be met by the Office 365 environment. Our main takeaway from this survey is that Microsoft Office 365 presents a clear solution to the requests of organizations of all sizes and types regarding how they handle eDiscovery. Those seem to be best encapsulated in the words of FRCP 1, “ …just, speedy and inexpensive,” with the added factor of “all under one roof.” Microsoft Office 365 eDiscovery is well underway to meeting that need.